Weighing in at 11 times Jupiter's mass and orbiting its star at 650 times the average Earth-Sun distance, planet HD 106906 b is unlike anything in our own Solar System and throws a wrench in planet formation theories. This system is also of particular interest because researchers can still detect the remnant "debris disk" of material left over from planet and star formation. "Systems like this one, where we have additional information about the environment in which the planet resides, have the potential to help us disentangle the various formation models," Bailey added. "Future observations of the planet's orbital motion and the primary star's debris disk may help answer that question." UA astronomy professor and MagAO principal investigator Laird Close said: "MagAO was able to utilize its special Adaptive Secondary Mirror, with 585 actuators, each moving 1,000 times a second, to remove the blurring of the atmosphere. The atmospheric correction enabled the detection of the weak heat emitted from this exotic exoplanet without confusion from the hotter parent star." 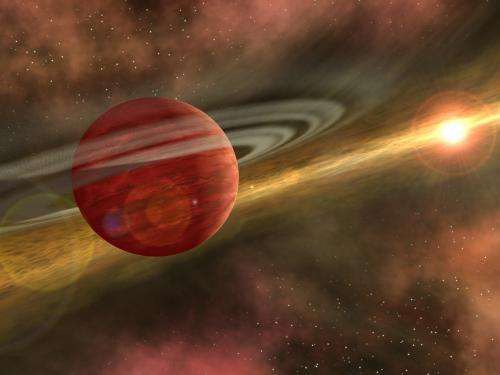 "Clio was optimized for thermal infrared wavelengths, where giant planets are brightest compared to their host stars, meaning planets are most easily imaged at these wavelengths," explained UA astronomy professor and Clio principal investigator Philip Hinz, who directs the UA Center for Astronomical Adaptive Optics. The team was able to confirm that the planet is moving together with its host star by examining Hubble Space Telescope data taken eight years prior for another research program. Using the FIRE spectrograph, also installed at the Magellan telescope, the team confirmed the planetary nature of the companion. "Images tell us an object is there and some information about its properties but only a spectrum gives us detailed information about its nature and composition," explained co-investigator Megan Reiter, a graduate student in the UA Department of Astronomy. 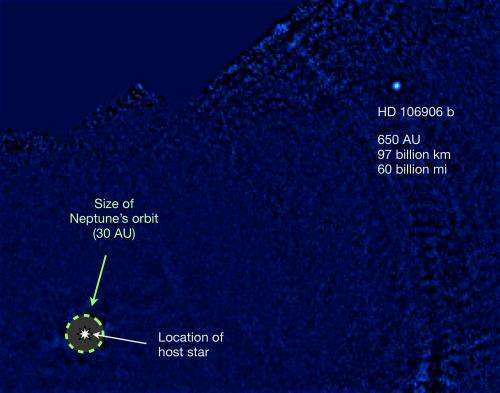 "Such detailed information is rarely available for directly imaged exoplanets, making HD 106906 b a valuable target for future study." "Every new directly detected planet pushes our understanding of how and where planets can form," said co-investigator Tiffany Meshkat, a graduate student at Leiden Observatory in the Netherlands. "This planet discovery is particularly exciting because it is in orbit so far from its parent star. This leads to many intriguing questions about its formation history and composition. Discoveries like HD 106906 b provide us with a deeper understanding of the diversity of other planetary systems." The planet possibly was formed near a different star, wrenched away be a close encounter, and recaptured by it's 'adopted' parent star. A confusing article. Brown dwarfs, that form by gas collapse, now start somewhere down at 9 Jupiter masses I believe. But there is a mass overlap with gas giants, which in one main theory form by core collapse, first accreting a core, then gravitationally collapse gas onto it, which there is time to do. @tadchem: Good idea. But the debris disk indicating the same age of star and brown dwarf 'star' makes such a scenario less likely. But a concurrent system formation in a molecular cloud may have brought these together to gravitational binding early on, to use your core idea. Just playing the numbers it ought to happen from time to time. Eer -,-Thats a joke. Best one for the day. The Universe is large, very large. Sorry for writing such a banality but some times it's useful. Now, if the Universe is so large, you can expect things that are very very rare. In this case, also that a star captures a very slow planet passing by. So slow that it was captured even at that infinitely low gravitational force at that distance. That was my guess but it has problems. That should be an extremely rare event and statistically speaking we shouldn't have seen one for a long time, if ever, considering how few planets we've discovered and our primitive tech level in this science. Main item missing in the article: According to the recent (ideological) definition of the planet - this object can't be a planet. Is not a planet. Both the observed evidence that it "didn't clear the neighborhood" where it orbits and simple calculation that can show that even a giant of such size simply can't "clear the neighborhood" if on such distant orbit. By the current definition of a planet the ability to call an object "a planet" ceases quickly with the orbital distance, even for a most gigantic, almost failed stars objects. Actually no matter what criteria ya use this is not a planet. Planets first must orbit the Sun. Not just any ol' star,,, the Sun. This is an exoplanet or substellar object. The definition of planet is just fine, if people would only stick to it.